Let's just say I have had better weekends. The past few days have been a myriad of emotional highs and lows for me. Losing someone is never easy. Believe it or not, it's even more difficult when it's someone you've never met face-to-face, hugged, or high-5'd. But yet, you feel as if you've known them your entire life. 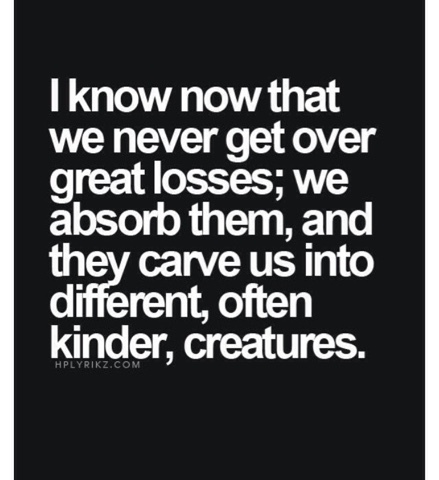 Such was the case with the friendship Michelle and I shared. I met her in January of 2013, just after I started this blog and my Facebook page Running on the Fly . Her and I had an instant connection....close in age, married with teens, and both of us were about to embark on training for our first marathon. We messaged each other frequently, and sent cards and "goodie packages" back and forth from time to time. Shortly after completing her marathon (November 2013), she was diagnosed with colon cancer. Thus began the toughest race of her life. She went through several months of treatment and, in the summer of 2014, was given a clean bill of health. 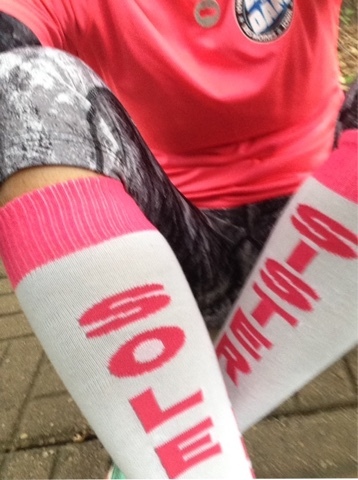 There were several others, as well as myself, who were blessed to receive Sole Sister socks from her in the mail. She was so excited for what the future held for her, and appreciative of the friendship and support of her "Sole Sister Team." The socks were a token of her gratitude. What I don't think Michelle quite realized, though, is that not only were we helping her through that difficult time...she was also helping us. I have never been through chemo, but have known people who have had to endure it. I know it's a scary and challenging experience, and not very pleasant. Michelle, however, made it seem like it was just a small hurdle to pass over. Her spiritual faith was impeccable, and she always had a positive reflection to share or an uplifting Bible verse. Imagine our shock and disbelief when she told us that the cancer had returned this past winter. 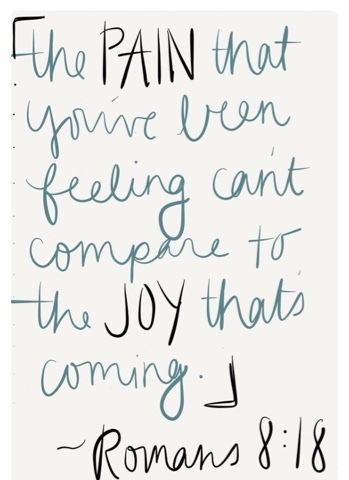 More treatments, followed by some setbacks...but all the while Michelle continued to stay positive. The treatments weren't working as effectively this time. And there were complications. None the less, she was always one step ahead of us...sending us birthday cards, surprising some of us with hand-made presents, and always being positive about her situation. She passed away on Thursday morning, but most of us didn't find out until later in the day. It truly felt like the world had briefly ended. I had just sent her a pic of me from my race last weekend (I was wearing the Team Michelle bracelet she had sent me) and she'd replied back, congratulating me on my finish time. Several of us have been messaging/texting/consoling each other on the loss of our friend and Sole Sister. And none of us have ever met her in person. That's the beauty of our running community.....we don't have to meet face-to-face to know each other. All of us are hurting, and all of us feel a huge void. But yet, I don't think Michelle would want any sadness...so I am dong my best to celebrate her memory and truly appreciate all the beauty she brought into my life the short while I knew her. I went for my first run since her passing on Saturday morning. 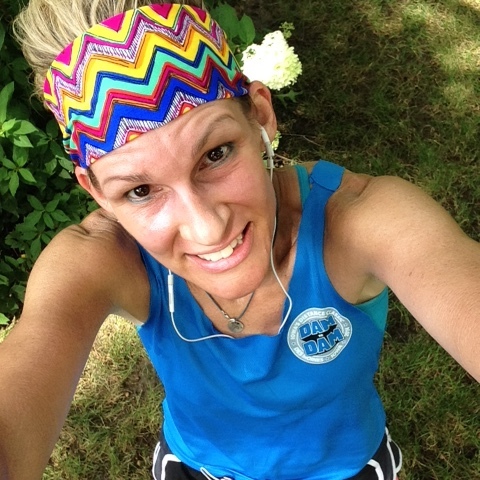 The air was humid, the wind was a bit crazy, and my legs felt like lead. I decided to take a different route, and do a good-sized hill....a hill I'd been eyeing but had never before attempted. Most of the run felt difficult....until I began the ascent on the hill. I never once had any fleeting temptations to walk, but instead I felt an intense inner strength like never before. I made it to the top of the hill (about 3/4 mile) and felt incredible. Those seven miles on Saturday were difficult, but also fulfilling and very cathartic. 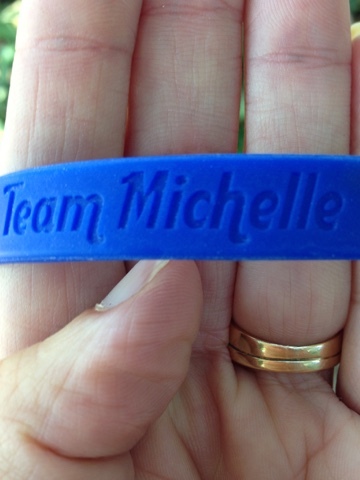 Michelle left a very vivid mark on all those who knew her. Although the time her and I shared as friends ended much too soon, I am so grateful for what we had. Have you ever lost a "virtual" friend? 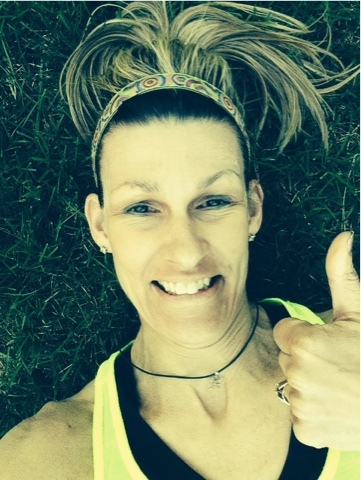 Ever done a difficult run, but felt empowered to keep going? A lot of people find comfort & security in doing the same things over & over, again & again. 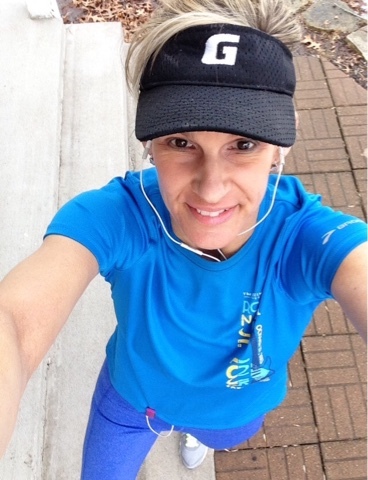 A favorite running top always gets paired with the same bottom, for example. No exceptions. I respect that. But Myself? No thanks. I like to keep 'em guessing. Just like with my "regular" clothes, I am always mixing things up with them as well. I seldom ever wear the same "outfit" more than once... and if I do, I find a way to tweak it so it looks different. And, it doesn't stop with my running clothes. The same goes for my hair. 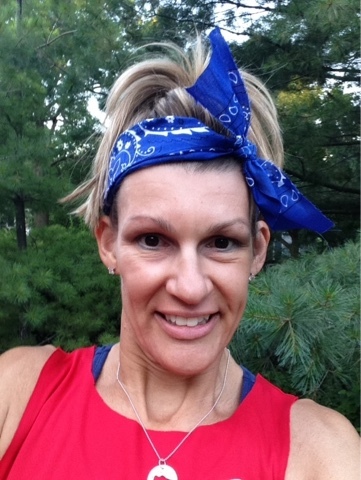 I've tried most every kind of hair option while dressed in running gear (except for cutting it short). I even have done an off-to-the-side ponytail...but it's difficult keeping my layered hair all gathered and "in place" when doing so. My favorite is the flip-&-pull-through (F&PT). Currently, my hair is at its all-time longest length ever, and I've gotten so the bouncing pony tail thing kind of annoys me, so the F&PT avoids that issue. It's no secret I've always been a fan of visors, especially if there's even a slight chance of sprinkles. Not only do they keep the hair off my face, but should there be a few rain drops, my eyes stay pretty dry and clear, too. 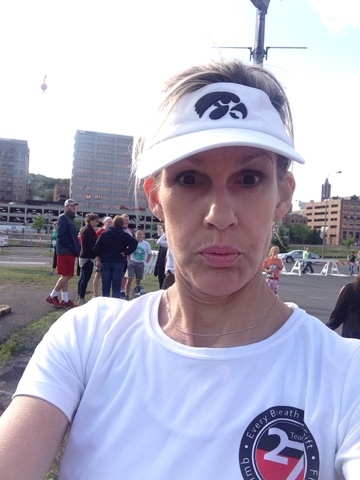 If there's a downpour in the forecast, though, and it's a race (that I have paid a lot of money for) or a desperately needed training run (that I can't afford to miss)...I will wear a hat. Even though I look like a dork in a hat, it's a necessity to keep the hair somewhat "dry" and a little less of a burden. If the rain has already started, I will braid my hair to keep the sweaty tangles somewhat under control. And, on occasion, I have used bandanas. Even though they sometimes look cute, they are a magnet for perspiration...and once saturated, they tend to stay saturated. Lately, I have been using headbands more. 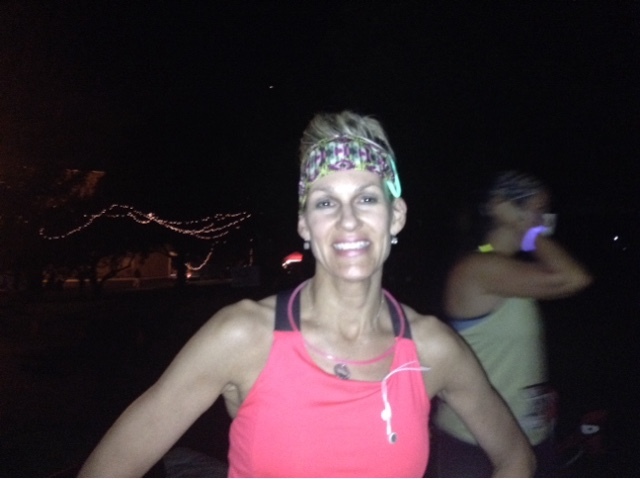 Not only do they keep the loose whispies out of my eyes, but they also add a touch of color & pizazz (once, I even attached a glow bracelet around a headband for an overnight race). 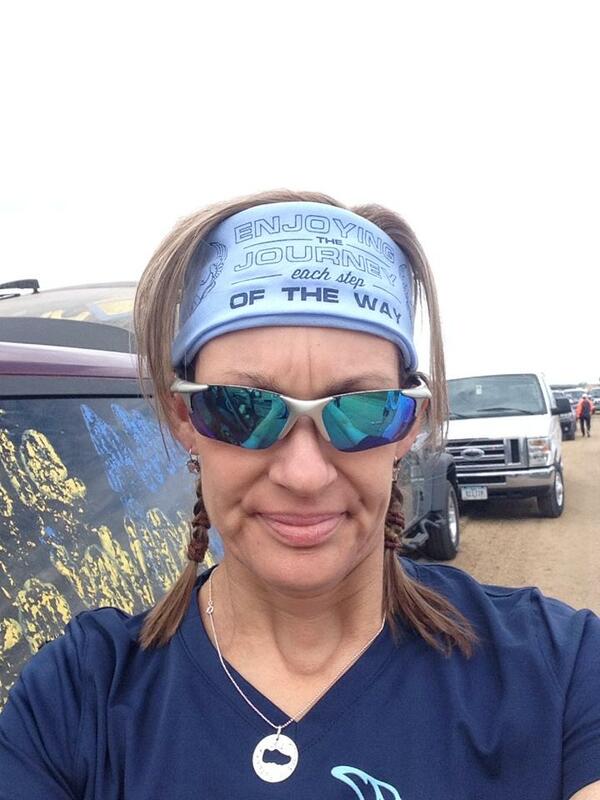 Recently, I did my first Duathlon, which gave me a new challenge with the hair. Not only did I have a helmet to deal with, but also post-helmet hair for the final (running) leg of the event. There wouldn't be time to fix my hair in the transition area, so I French braided my hair (so it would fit under the helmet easily) and wore a headband to keep the whispies under control (and look somewhat stylish) when I tossed the helmet. And then there's the cold weather running, when you need to have the ears covered. 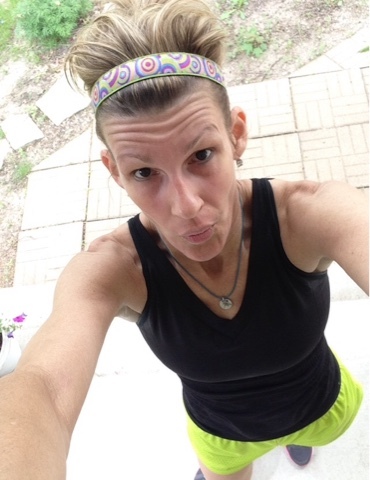 My go-to favorite is a pretty, fleece head band. I have a variety of these in numerous colors, so I'm never without options. So, there you have it. Some ideas on how to add a little variety to your hairdo options...any of these look like some you might want to try? A lot can happen on a Wednesday evening, especially after a busy morning (doing speed work on the track) and working most of the day. How about knocking a couple "bonus miles" at a group run? Works for me! Have you ever done a group run? I don't have the opportunity to take part in them very often, but when I do hook up with a bunch of other like-minded people, it's always a great time. 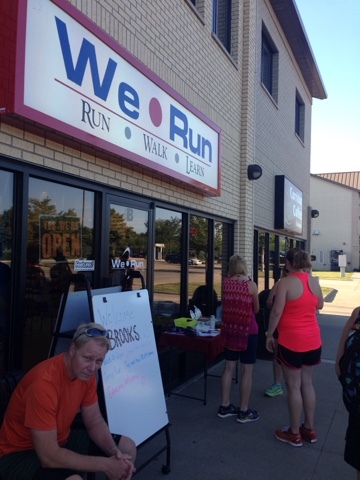 There's a nearby running specialty store that offers several group run opportunities each week. Everyone meets up, signs in (so there's a record of who all is participating in case someone may need assistance) and we all head out as a group. These runs usually are on an asphalt trail, on an out-and-back format. The participants run as far as they wish (most of the evening runs last about an hour). When everyone meets back up at the store, there's usually several that go have dinner. 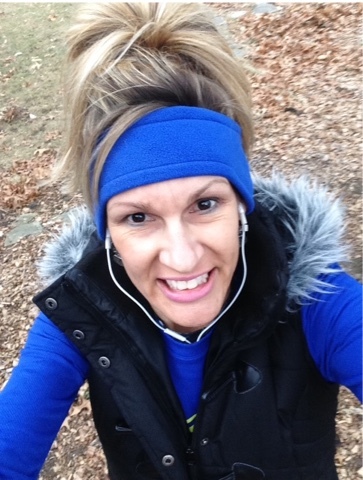 I became acquainted with Kris, owner of We Run (located in North Liberty, Iowa), back in January when I was in search of some solutions to my on-going shoe problems. My friend, Paula (who lives near the store) invited me to come up for a group run, and afterwards Kris worked with me on getting me fitted for some new kicks (the story is HERE). Fast forward to March, another friend (Barb) and myself took part in the We Run-sponsored Lucky Run...and I also bought a second pair of running shoes from the store (Mizuno Wave Inpsire 11's, the same model as the January purchase but in a different color). 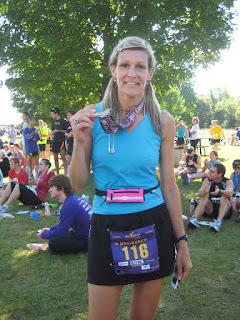 Barb and I also ventured back to North Liberty for a couple other group runs in the spring and summer. Fast forward (again), and we are now in August. Although my mileage has been on the conservative side in 2015, I haven't exactly been sitting very still.... and I have logged plenty of miles. 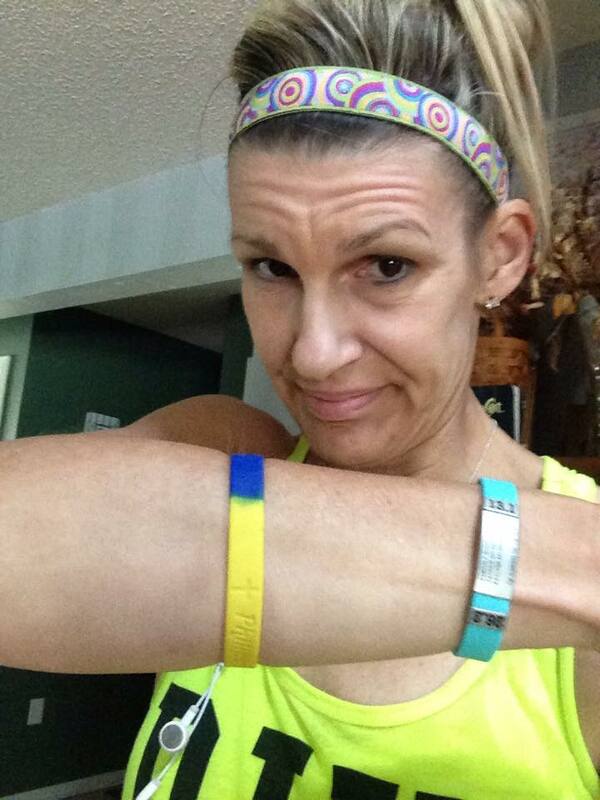 There have been a some half marathons, a full marathon, and an ultra marathon. And several other races of shorter distances. Yadda yadda yadda. All of these have been run in the two pairs of Mizunos, and recently I have noticed that my hamstrings have been a little angry (again). 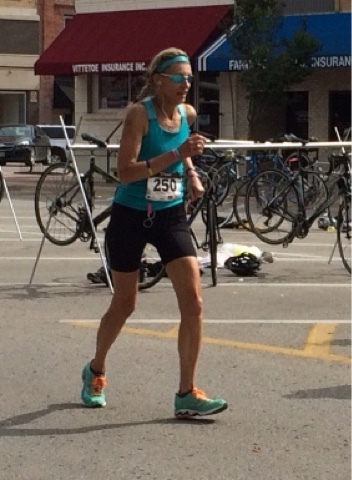 I was attributing it to the past 6-7 weeks of racing (which included the marathon, the ultra and also a duathlon), not really noticing the shoes were on the verge of wearing out and not giving me the support my over-pronating feet desperately need. 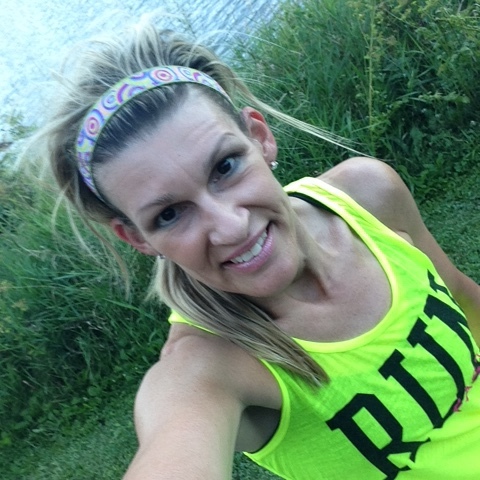 I finally had a free Wednesday evening, so the husband and I headed to North Liberty to do some group running. A neat feature, and a HUGE perk to going to a store-sponsored group run, is getting the opportunity to periodically sample shoes from various companies. When I say "sample shoes from various companies," I mean you get to take the shoes out for an actual run (not just a couple laps around the parking lot). 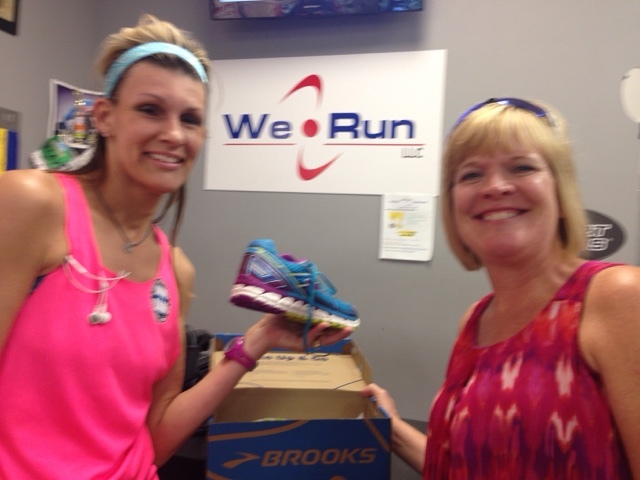 The Brooks representative was scheduled to be there this week, and I was eager to test out a pair of their shoes. The Wednesday group runs start at 6:00PM, so we arrived around 5:45 to have a few minutes to get situated. The Brooks guy had a big selection of shoes to choose from, and Kris helped me find a stability shoe in my size (the Adrenaline GTS). There wasn't a ladies shoe in my size, but we found the men's equivalent. I put on the shoe and, immediately, it felt like I was walking on pillows! We headed outside, and the run started a few minutes later. 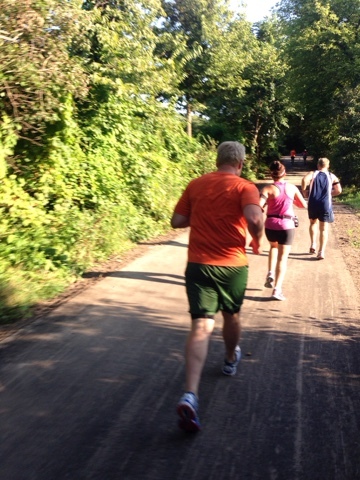 I had also done a track workout earlier in the morning, so I did not plan to run very far (only a couple miles). My hamstrings have been a little achy, so I was leery of going too far in "strange" shoes, but the Brooks Adrenalines really felt great! But, YIKES! It was hot! Pat and I were the first ones back (since we'd only run about two miles). I really was impressed with how good the shoes felt, especially since my body was already a little tired from the morning's workout. The hot weather added to the challenge, as well as the rolling hills of the trail. But my feet and legs felt pretty good in the test shoes. Back at the store, Kris brought out some Mizunos, Asics, and Brooks shoes for me to try on (after I had a few minutes to cool off). Although the Mizunos had been a great shoes for me, it seemed like the support just wasn't enough. Also, the soles were showing some serious signs of wear and tear, especially under the balls of my feet. Kris explained that although both shoes had about equal support, the Brooks had a little more cushion and didn't usually need any breaking-in. 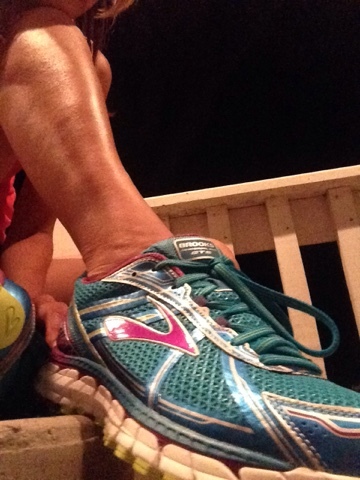 The Asics felt alright support-wise, but the Brooks felt a little better. I also tried another Mizuno (Paradoxes), but the padding under the ball of my left foot hit me in a strange spot....so those went back in their box. I also have been dealing with a bit of plantar fasiitis this summer, nothing chronic, but an issue none-the-less. I feel it mainly under my left heel, and sometimes at the base of my second and third toes. Kris suggested that the Brooks (with their ample cushioning) may be my best option right now until the plantar fasciitis is eradicated, and I agreed. 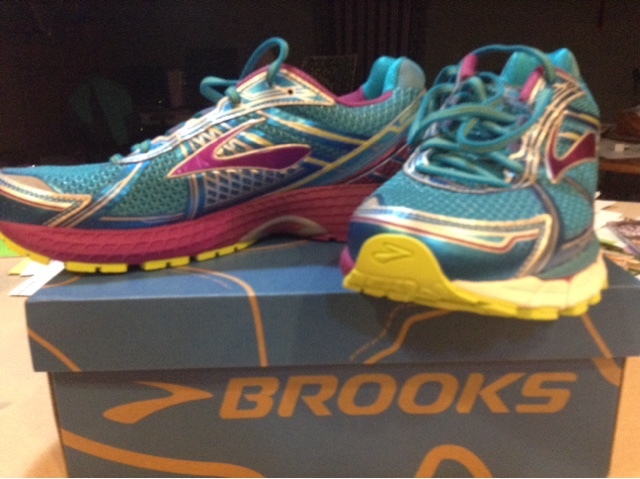 So, the Brooks Adrenaline GTS 15's are the ones that went home with me. Back home, I took them out for a walk with Max. Heaven, I felt like I was in heaven! I'm excited to log a few miles in them soon! What do you think of trying out different brands and models of shoes? It's great if you can find the perfect shoe for you, but I have learned that my needs are constant changing and evolving. I have been doing a lot more mileage in recent years, not necessarily running more frequently but definitely running longer in my training for longer distance events. Also, most manufacturers are constant changing and improving their various models of shoes.....I like to keep experimenting with different brands/models to see how they feel and work for me. Who knows? There might be a "perfect" shoe out there for me, somewhere. If I keep looking, maybe I'll eventually find it. In the mean time, I'm keeping an open mind to what's available. How about you? Got a favorite brand/model? Do you experiment with other brands/models? I Done Did a Du! 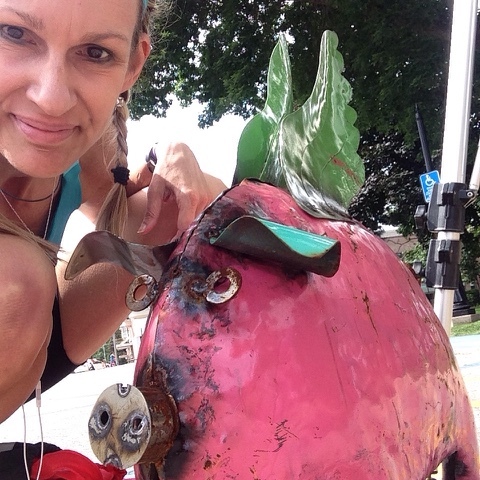 A selfie with the Flying Pig...isn't he cute? What happens when you're on a quest for new (to me) events, but want to honor your Recovery Pledge? You do a du! Being a huge advocate for all things cross-training, I have progressively been doing more biking. 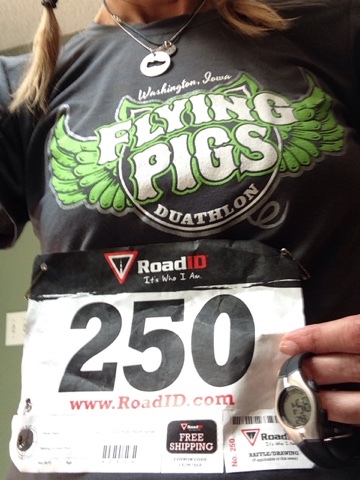 I have toyed with the notion of doing a duathlon, but hadn't found one nearby until I saw a link for the Flying Pigs Duathlon (Washington, IA). This event intrigued me because of the run/bike/run distances. 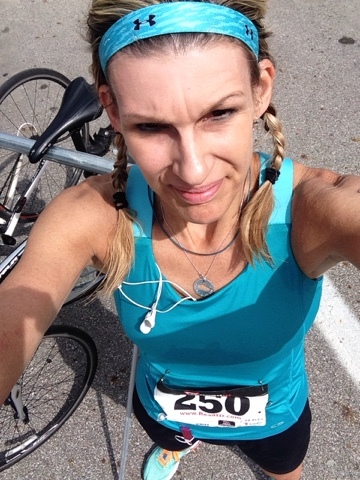 A lot of duathlons have similar running distances (this had a 5K for the first run, then finished with a 1.5 run to the finish), but the biking segment was 20 miles (the majority of duathlons I researched had shorter bike segments, usually 10-miles). I have been keeping my running mileage to a minimum (since my ultra a couple weeks ago), so this was a perfect fit. 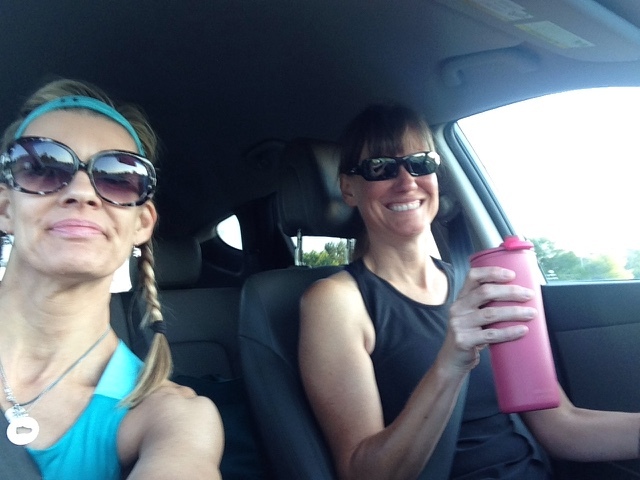 A long-time friend, Paula (who just happens to be an avid biker), joined me for the adventure. 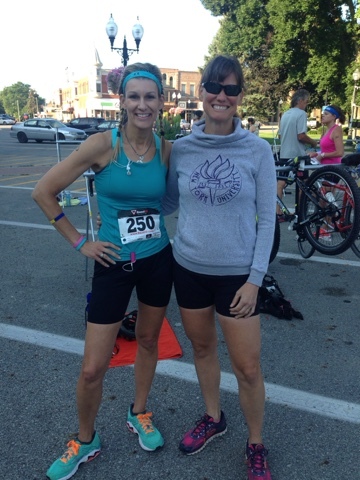 Paula is also a veteran duathlete, so she was the perfect mentor for me. Since I don't own a road bike (I have a mountain bike), Paula offered me her bike (and she used her husband's bike). The event location was about 75 miles away, and Paula lived closer than I did, so I drove to her place Friday night. 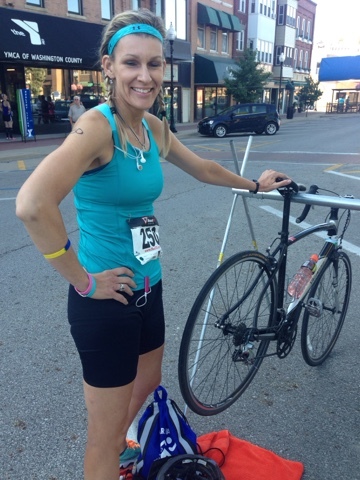 Besides, I was a little apprehensive about using a borrowed bike, and I wanted/needed more than just a few minutes (in a parking lot prior to the race) to acclimate to the different pedals, gears, and "feel" of it. I was really nervous! Paula and I are about the same height, but I asked her to lower the seat a little so I could easily reach the ground for the "dismount" (my term). She showed me how to slide forward off the seat (while leaving one foot still on the pedal) in one easy (sort of) fluid motion....and (much to my surprise) I did so with ease (and I am not usually a graceful person). She congratulated me for "sticking the landing." We spent about an hour biking around her town, experimenting with the various gears for hills and starting/stopping techniques. Race day arrived with a 5:15 wake-up and a 6:10 departure, we arrived in Washington around 7:00. We had plenty of time to get our packets, rack our bikes, and use the bathroom (real bathrooms!) inside the YMCA! I did have a little race day anxiety, though. The running segments would be minimal, but the biking was a whole new ball game for me. Even though 18 miles was the longest distance I'd ridden, I wasn't concerned about going 20 miles. I was worried, though, about what could potentially go wrong....flat tire, derailed chain, difficulty remembering the gears, panicking (and face-planting) . Although I didn't know how to manage a tire change, I knew it would probably not be worth attempting to do on my own anyways...and was pretty likely to not be an issue. 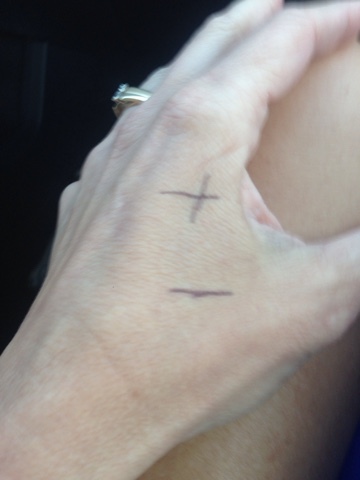 I did put a few reminders on my hands to help me remember how the gears worked. We received a few instructions on the routes and transition procedures (the period between the legs of the race, when you're transitioning to the bike, or back to running), and the race started. Oh, was it hot! And humid! Thankfully, a lot of the 5K route was shaded. 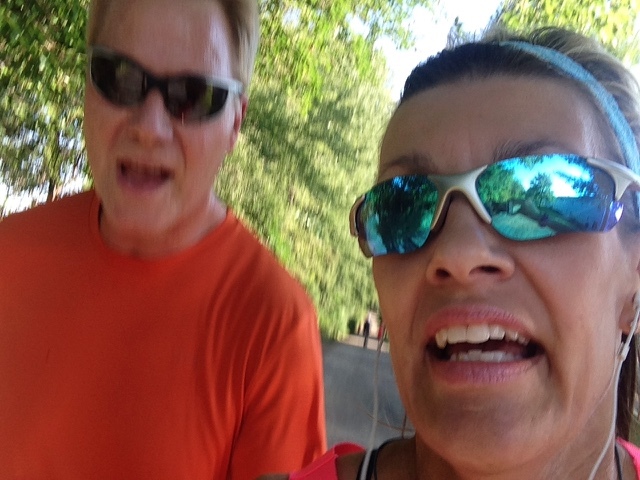 We were on city streets for most of the first mile, then we were on an asphalt trail before winding through a park, The final mile or so was on a brick-paved road, uphill. By then, I was feeling tired.....I wasn't necessarily running faster than normal, but the heat was pretty oppressive (and usually the heat doesn't bother me). I decided to walk for a few seconds to catch my breath before running the rest of the way to the transition area. Then, it was time to go biking! I had been both anticipating and dreading this at the same time. I felt totally out of my element as I snapped on my helmet, grabbed my fuel belt and got the bike off the rack. I sort of ran the bike (like I had seen others do) towards the timing line, mounted, and took off. Suddenly, within a few seconds, I could feel the wind. It felt pretty strong, but also a bit refreshing. In preparing for this event, I had been advised to have your water bottle ready to go on the bike. Also, to save time in transition, it was advised to wait until you were riding to take that first post-run drink. In my haste, I had forgotten to pop a piece of Plow-On Gum, so I reached around and grabbed it out of my belt. Twenty miles, on the open road, by myself....let's do this! We rode about a half mile through town (in a special coned-off biking lane for us), before getting to the highway. Heading west on Old Highway 62, we'd be going straight for about 6 miles. Already, I saw a big hill looming up ahead. And, already, I was approaching a couple of bikers.....I called out, "on your left" and they let me by. Little did I know, that little move (me passing other cyclists) would not be happening very many times (quite the opposite, actually). It wasn't long before Paula came whizzing by me. She told me I was doing great (ha! This was only the first mile or so), and I wished her good luck. I knew I wouldn't see much of her until the finish line, but I did see her in the distance for quite awhile. I am a born and raised Iowa girl. I have never lived on a farm, but I have been around them most of my life. But, Oh-My-Sensitive-Nose, the heavy humid air was SO nasty! I don't remember how many pig farms we passed, but there were plenty. I have a bionic sense of smell, so I could smell the "fresh Iowa air" for most of the entire route. It was kind of icky breathing heavy on the inclines and nearly gagging at the same time. But, alas, all of us had the same air to breathe, so the playing field certainly was leveled in that regard. I made it to the turn, and headed north. Although the wind was somewhat at my back, it still was somewhat of a crosswind, so I didn't feel too much relief for having changed directions. It wasn't until I was a couple miles before the turnaround that I spotted the lead racer coming back. It was awhile before the other racers started appearing. I shouted and cheered to most of them, and several gave me the thumbs-up. I was less than a mile to the turnaround when I spotted Paula. She was blazing! My left calf had been feeling a little strange. 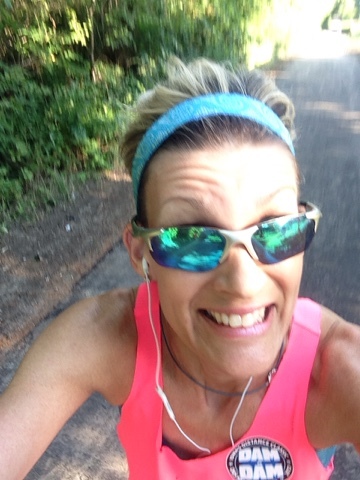 I had not noticed anything while running, but it felt like it was cramping after I was about 5-6 miles into the ride. I hadn't realized I had even been using my calf muscles, so I was a little confused why it would hurt at all....and just the left calf (the right one felt fine). I made it to the turnaround, which was just a cone in the road. As I slowed down, I put my left foot down briefly because I had to make a real sharp turn...and suddenly the calf muscle seized up. It literally took my breath away, it was so painful. I dismounted briefly, and tried stretching it and massaging it. The guy at the aid station came over and asked me if I was alright....and I thanked him, but I told him I would be fine (hopefully). I was gong to try to flex and stretch it as I rode back on the return trip...maybe I could coast a little (?) and work out the kinks in those last 10 miles. Well, heading back out, going due south into the wind...let's just say the "coasting strategy" would not be happening for awhile. Wow! That wind was brutal! It had felt pretty strong when I was going west, but heading almost straight into it was a game changer. Though the wind was a challenge, it was manageable. 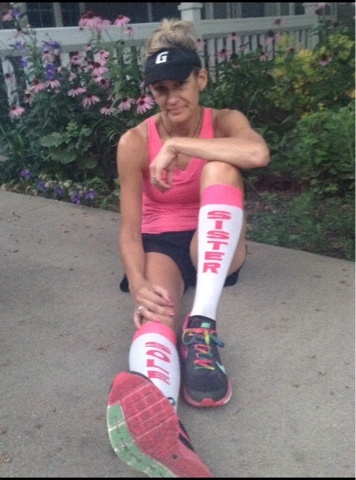 I wasn't feeling defeated by any means, and I was careful to sip some of my Nuun water every couple miles. Adding to the calf strain and discomfort, I started to notice my helmet was feeling uncomfortable as well. It's a helmet I have had for several years, and have not used it much until recently (because I have not been much of a cyclist). I think I have some pressure points (for lack of a better diagnosis) near my hairline, because I usually notice headache-like pains after awhile when I am wearing the helmet. 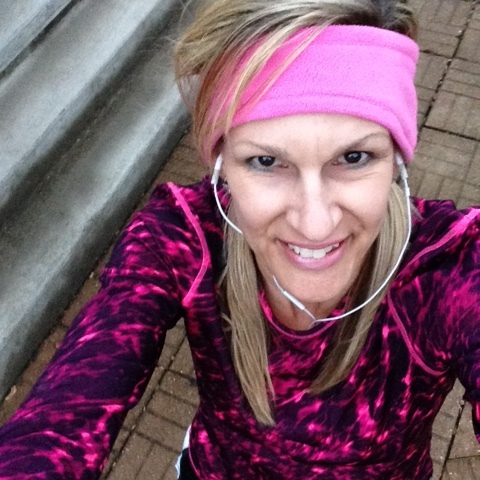 Sometimes wearing a headband helps to "cushion" the problem, sometimes not (today was a "not"). Eventually I made it back to the main highway (Old 62), and turned to head east back into town. Finally, the wind at my back! 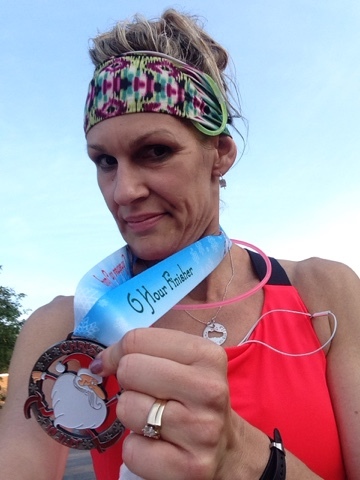 This would give me a chance to makeup some time from the previous 15-16 miles, and maybe catch up with some of the others who had passed me (not realizing, until after the race, that all the other racers would also have the wind at their backs as well...DUH!). The final miles on the bike went well, despite my constant readjusting the helmet and periodic coasting with my left leg extended to point/flex the calf muscle. As I crossed the timing mat and pulled into the transition area, I heard them announce my name...telling the crowd that I was headed to the final leg of the race. That gave me a little boost of mojo as I racked the bike and pulled off the helmet and fuel belt. Then, I headed to the streets for the final 1.5 mile run. Except my legs did not want to move very fast. What? Seriously? Is that what 20 miles of cycling will do to you? I ran for a couple blocks, VERY slowly, and passed a guy who was already walking. We were headed up a slight hill, and a short while later, I decided I needed to walk as well, just for a minute to (hopefully) loosen up the tightness in my legs. I saw a few of the other racers, coming back from the turnaround...and they all were running slow as well, looking as awkward as I felt. I saw Paula and she gave me a cheer and said she'd see me at the finish line. I broke back into a slow run, and continued for awhile. I was able to run most of that 1.5 mile leg, though I did do a couple quick walk breaks. I was running so slow it felt like I could actually make better time by (attempting to) speed walk instead. Finally, I made it to the finish line. Like so many other hard-fought races before, all the aches/pains/frustrations were instantly forgotten and replaced by the finish line endorphins. My goal had been to finish with a sub-2-hour time, and my watch said 1:58:28. Mission accomplished! About to cross the finish line.....barely able to lift my feet off the ground! Paula captured my pic, and was there to give me a high-5. It took a few minutes for it all to sink in.....that I had just finished a duathlon! I had endured 20 miles on a (borrowed) bike, going upwards of 25mph at times, and survived! We walked around for a bit, chatting with some of the other racers. My calf was feeling better, but still a little wonky. Paula said her left calf had been bothering her also. Coincidence? 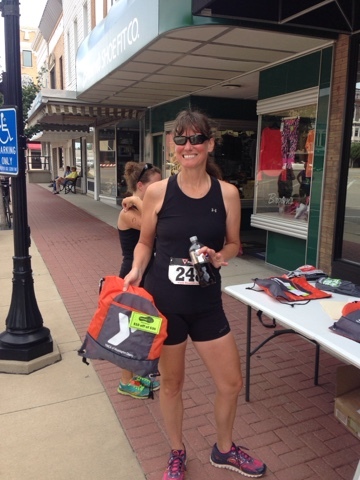 They announced the top finishers, and Paula got 1st in our age group! She was surprised, but I wasn't....she's a strong biker chick! So, what do I think of doing a du? Bottom line, it was a great challenge! It definitely got me out of my comfort zone, on so many levels. I went into this event not so much as a "racer" hoping for a fast finish, but as an eager "participant" testing the waters. Having no idea how I'd do on the bike, I estimated 90 minutes for the biking leg (20 miles with hills, humidity, heat and plenty of wind). I knew I could run the 5K anywhere between 25:00-26:30, and the final 1.5 mile approximately 15 minutes...giving me an estimated total finish time of 2:11ish, adding an extra miscellaneous minute or two for the (2) transitions would put me in around 2:13 (but I was hoping to finish under 2 hours if possible). I LOVE the race shirts! I have not yet seen the official results with our splits. According to my watch, I ran the 5K around 26:35, made it to the bike turnaround (at 10 miles) with 1:07 on the watch, back to the transition (from finishing the total 20 miles) in 1:44, then final finish time of 1:58:28. My observations...the 5K took a little longer than I'd liked (but I stopped and walked briefly), I was happy to see the negative split on the out & back of the bike leg (which includes that brief stop at the turnaround when my calf muscle screamed at me), the final 1.5 mile leg felt very SLOW (for myself, and it looked like it was for most of the others as well)...but running it in 14 minutes (and some change) was still under a 10-minute pace, actually a decent pace considering my legs felt like they were never gonna move again. **the cheat marks on my hands. Even though I knew the basics of shifting, being on an unfamiliar bike was a little nerve-wracking. Having the reminders of what gear went which way (depending on the tension I wanted) gave me some much needed piece of mind. ** all the research I did (and advice from friends) about race day tips pointed to transition being a key component. Granted, I was not "racing" in hopes of winning, but transition was the place that could make or break your finish time. 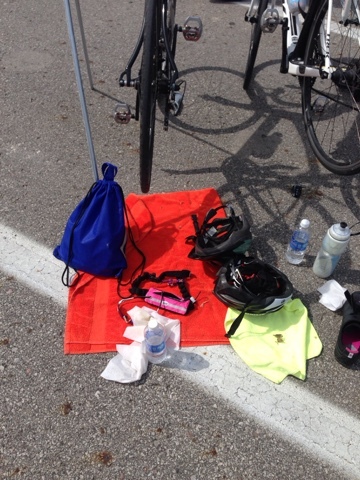 I brought a bright orange towel to mark my spot (and help me identify the borrowed bike). I snapped on my helmet first thing and strapped on the fuel belt immediately afterwards. I had the water (with Nuun) pre-made and in the holster. I didn't even stop to catch my breath. 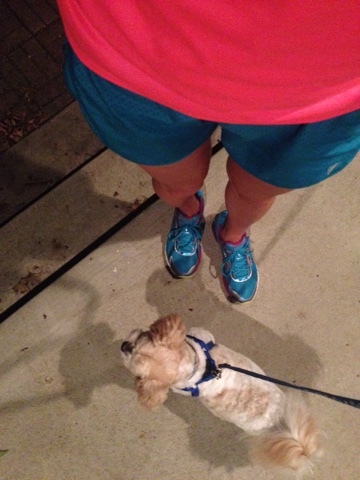 **Wearing my usual running shoes (and not dealing with bike shoes). I'm a biking newbie, and I am horribly klutzy. I do not own bike shoes (yet), and I knew this was not the time or place to experiment with them. Paula's bike pedals had clips, but also could be turned upside-down (like "normal" bike pedals). I saved some serious time by not changing out of shoes for either transition. 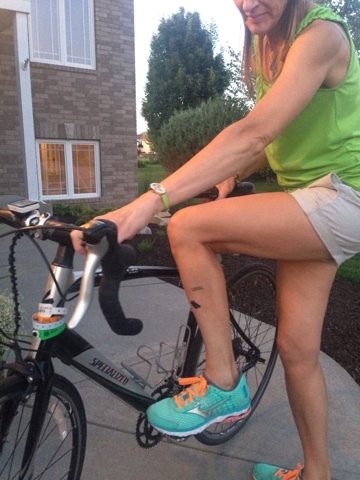 I'm sure any experienced biker will tell you the advantage of bike shoes vs. regular shoes will make up for any lost time in changing out your shoes...but I am not an experienced biker and did not wish to invite trouble or additional stress. **as frustrating as the wind was, I did try to enjoy the feel of it. **I don't know if it's normal protocol in biking, but every time someone passed me (both while en route and the ones returning from the turnaround), I gave them a thumbs-up and said something ("Good job!" "Looking good!" "Woot woot! Girl power!"). I'd rather be the "average" racer who encourages her competitors than the "finish-line-focused" snob. ***much, much more time in the saddle. Like running, I would guess the only way to become a better cyclist is to do more cycling. This event was a bit of a last-minute decision, so I really did not spend the summer training for it (shocker, I know). Going into it, I knew the cycling would be the biggest challenge for me. ***cycling gear. Plain and simple, having a road bike of my own would be ideal. I'm just not ready to make that kind of an investment in a sport I'm not totally committed to doing (yet). Padded shorts (eewww!!! ugh!!!!) and biking shoes (eek!!!) are also things to consider. And a new helmet! ***more brick workouts, involving longer rides. I'm not a stranger to bricks, but my "bricks" usually involve more running than cycling and that needs to change if I get a little more serious about this and/or do future events. Running that final 1.5 mile leg after having just biked for 20 miles was brutal! Paula compared it to a death march, and I have to agree. So, there you have it. Another bucket list item checked off. 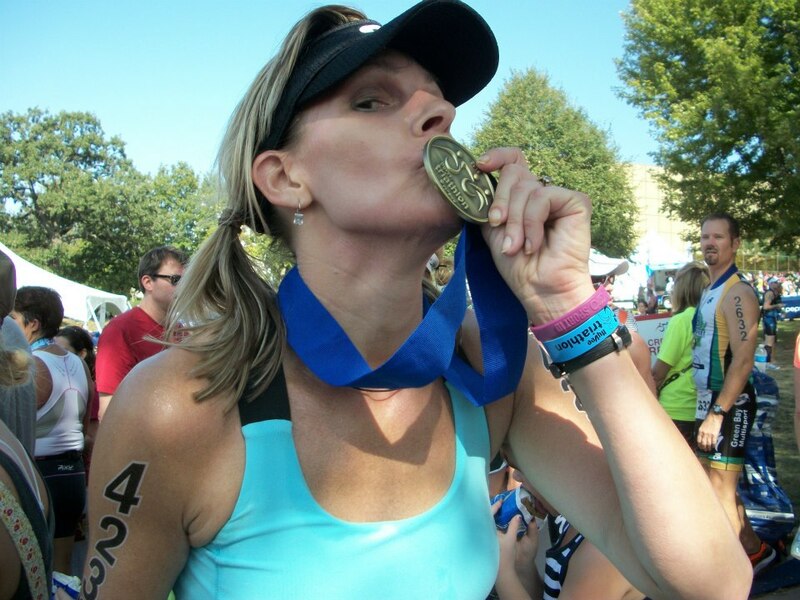 Have you ever thought of doing a duathlon? Do you know much about biking, or are you a newbie, like me? Does the thought of wearing padded shorts creep you out, like it does me?